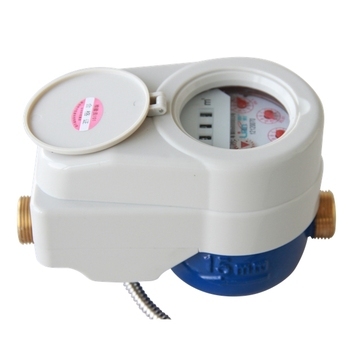 LXSY-15/20FK Photoelectric Coding Type Remote Reading Water Meter with valve control (Hereafter called LXSY-FK) adopts Photoelectric Coding Technology to read water volume directly from register of meter. By directly reading water volume from register by photoelectricity method, it has almost no error of during mechanical-electric conversion compared to traditional pulse water meter. Meanwhile, it only required power supply when reading meters, which cost very low power consumption. LXSY-15/20FK adopts Vane Wheel Type mechanical water meter, which ensures high accuracy, low start flow rate, easy reading long life span etc features. Moreover, by application of LXSY-15/20FK and Laison Intelligent Management System (LIMAS) it ensures the accurate meter reading of water meters and perfectly realizes data sharing with database center. Ø It requires water supply only when reading meters and do operations to valves remotely, which ensures low power consumption of LXSY-FK. Ø By adopting Vane Wheel Type Mechanical Water Meter, it has characteristic of high accuracy, low start flow, easy reading etc. Ø Mechanical part and other functions comply with standard of GB/T 778.1~3—2007 Accuracy Class 2, Electrical part is in conformity with standard of CJ/T 224-2006. Ø Compatible with different types of communication protocol: DLT645(1997), CJT188 or customized protocol. Establish an automatic remote reading & management system by using corresponding PC software and ensures a perfect automated meter reading system.